Welcome to the world of Product, Process and Equipment Design and the need for Applied Ergonomics - especially in footwear design. One of the first things that you need to consider while you are working on the first iteration of product, equipment or process design is the integration of ergonomics and safety. Whether you are developing a new product, process or piece of equipment, the users’ interface with the new design must be considered. Designing footwear for a particular application and for the users’ comfort is of utmost importance. Standing is a natural human posture and by itself poses no particular health hazard. Working in a standing position on a regular basis, however, can cause ailments from sore feet to stiffness in the neck and shoulders, and other health problems. These are common complaints that employees who are working as machine/equipment operators, assembly-line workers and others whose jobs require prolonged standing. These conditions commonly occur where the job is designed without considering the characteristics of the human body. When job design ignores the basic needs of the human body (and individual workers), work can cause discomfort in the short term and can eventually lead to severe and chronic health problems such as rheumatism and arthritis. Too much walking over hard or uneven surfaces is also a problem for leg and foot discomfort that might lead to an injury. The design of footwear that is specific to a job design considering the safety aspects and comfort can mitigate the injury potential. There is an old saying that goes, "When your feet hurt, you hurt all over." There are two major categories of work-related foot injuries. The first category includes foot injuries from punctures, crushing, sprains, and lacerations. They account for 10 % of all reported disabling injuries. The second group of injuries includes those resulting from slips, trips and falls. They account for 15 % of all reported disabling injuries. Slips and falls do not always result in a foot injury, but lack of attention to foot safety plays an important role in their occurrence. Surveys suggest that two out of every three workers suffer from some form of a foot problem. The type of flooring used in the workplace can also contribute to foot problems and has an important influence on comfort, especially on tender feet. Hard, unyielding floors like concrete are the least comfortable surfaces to work on, while slippery floors are hazardous for slips and falls that can result in sprained ankles or broken foot bones. There is not a workplace where an employee is not exposed to foot injury potential. From hospitals to oilrigs the hazards differ according to the workplace and the types of tasks the employee performs. The first step in developing a strategy to reduce foot problems is to identify the relevant hazards at the workplace. Such hazards should be assessed in each workplace, no matter how safe or how dangerous it may seem. The most important goal of job design is to avoid fixed positions, especially fixed standing positions. Good job design includes varied tasks requiring changes in body position and using different muscles. Job rotation, job enlargement and teamwork are all ways to make work easier on the feet. How can the workplace design improve foot safety? Redesigning the job alone will not effectively reduce foot problems if it is not combined with the proper design of the workplace. Flooring can be a source of prevention as well. Standing or working on a hard, unyielding floor can cause a lot of discomfort. 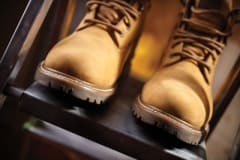 Wood, cork, carpeting, or rubber - anything that provides some flexibility - is gentler on workers' feet. Where resilient floors are not practical, footwear with thick, insulating soles and shock-absorbing insoles can alleviate discomfort. Anti-fatigue matting can also be useful wherever workers have to stand or walk. While this provides cushioning which reduces foot fatigue, use carefully as when installed improperly, it can lead to tripping and slipping accidents. Special anti-slip flooring or matting can reduce slipping accidents. If installed properly, these mats are useful, but workers may find that their feet burn and feel sore. The non-slip properties of the flooring mat cause their shoes to grab suddenly on the flooring making their feet slide forward inside the shoes. Friction inside the shoes produces heat that creates soreness and, eventually, calluses. A non-slip resilient insole can reduce this discomfort. Proper footwear is important, not only for foot comfort but also for one's general wellbeing. Improper footwear can cause or aggravate existing foot problems. Unfortunately, being fashionable sometimes takes precedence over choosing well-fitting, supportive safety footwear. Many safety footwear manufacturers, however, produce safety footwear that does look fashionable. When selecting footwear, one should remember that tight socks or stockings can cramp the toes as much as poorly-fitted shoes. Wrinkled socks, or socks that are too large or too small, can cause blisters. White wool or cotton socks may be recommended since coloured socks may cause skin allergies in some people. Employees need to understand the importance of footwear that is properly designed. When considering these strategies to protect foot injury, we have to remember the fundamental principle of occupational health and safety: that occupational hazards should be eliminated at the source. Providing adequate protective footwear is an effective protective strategy. 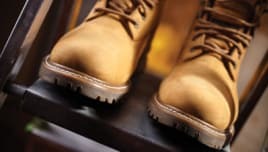 By providing approved protective footwear and requiring its use, the construction industry reduced the frequency of foot injuries by 60 % over the 15 years between 1968 and 1984. All working footwear, for both men and women, whether it is safety wear or not, should provide comfort without compromising protective value. In addition, protective footwear should conform with all appropriate standards. Thermal environmental issues must also be considered. Selection should be made to suit the specific working condition. Working outdoors in cold weather poses a special requirement on selecting the proper footwear. ‘Normal’ protective footwear is not designed for cold weather. ‘Insulated’ footwear gives little temperature protection in the sole for it has no extra insulation there. Loss of heat through steel toecaps (commonly blamed for increased heat loss) is insignificant. Working in a hot environment such as those experienced by workers in the Middle East, foot care is especially important as severe problems can occur in these conditions. Considering that the formation of blisters can be considerably reduced if the feet are kept as dry as possible, care should be provided to reduce the humidity close to the surface of the foot. Even though a great diversity of so called ‘functional’ socks and ‘breathable’ shoes are available on the market today, there are still a lack of reliable and objective methods to simulate sweating inside the footwear at different levels of metabolic rate, and to measure the resultant temperatures and relative humidities. It is, therefore, difficult to judge or compare different footwear systems (consisting of shoes, socks and inlay soles) and their influence in a variety of climates. Socks have a major influence on the climatic wearing comfort of footwear systems for extreme environments. Thicker socks will provide a drier foot climate without considerably raising the skin temperature. It is as important to keep the feet dry and comfortable as it is to attend carefully to the design of footwear in the first place - an activity in which ergonomics play a vital part. Ergonomics: n: sing or pl: an applied science concerned with the characteristics of people that need to be considered in designing and arranging things that they use in order that those things may be used most easily, effectively, and safely - called also human engineering, human factors engineering. A combination of two Greek words, ‘ergo’ means work, ‘nomos’ means law; the study of the human response to exposure in the work environment; the interaction between humans and the tools, equipment and work methods needed to complete a task; fitting the task to the employee. Ergonomics is a multidisciplinary science comprised of engineering, mathematics, anatomy, physiology, psychology, biomechanics and anthropometry. Whatever you are designing, it must fit the person it is designed for. People come in all shapes and size, like or dislike colours, textures, forms and shapes. Consequently, when we design products, factors such as these should be kept in mind. But the most important factor is the fit, a function of anthropometry (the science of human body measurements). One size does not fit all! If safety glasses slide down and don’t fit the visual field, many employees will not wear them. If hearing protection is uncomfortable, many employees will not wear it - and so on. An example for the need of good anthropometrics is seen when feet are measured for footwear. Incorrectly measured feet can lead to the purchase of footwear that is unsuitable in terms of its size and that can be comfortable and unhealthy to wear. The more data collected relating to feet size, the more shoe designers and manufacturers will be able to produce shoes that are comfortable and healthy for the purchaser. In closing, design in ergonomics is important information not just for the engineers but for the purchasing agents of the company as well. Our most expensiveasset is the employee and we need them to continue working safely and efficiently. Ergonomics knowledge is the best tool we can provide throughout a company and job. Tool and equipment designs are integrated throughout this knowledge base to achieve profits and reduced injury potentials. ? Author Cynthia Roth has been a professional in the ergonomics industry since 1987. She also completed postgraduate work at Cornell University in Labour Relations/Industrial Management. ?